Our 1099 Software allows QuickBooks users print and file electronically 1099-INT forms. 1 ) Start by opening the W2 Mate software. 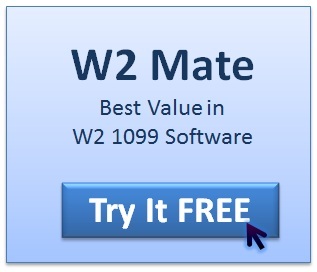 You can download a free trail of W2 Mate by visiting the 1099 software download page. 2 ) Make sure QuickBooks is open and the company you want to import forms 1099-INT from is also open. 3 ) Inside W2 Mate select Import Data and then From QuickBooks (W2 and/or 1099 Data). 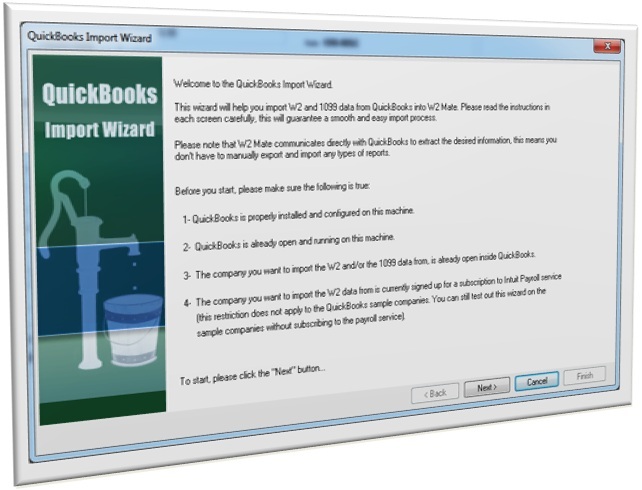 This will bring up the QuickBooks import wizard. 4 ) In the next step you will need to connect to QuickBooks, follow the on screen instructions. a. Select “1099 Data” for the type of data you would like to import. b. Under “Type of 1099 form you would like QuickBooks 1099 data be mapped to” select “Form 1099-INT – Interest Income”. 6 ) W2 Mate will read the 1099 data from QuickBooks and show it in a spreadsheet view. This view will show the 1099-INT boxes the way they will be imported into W2 Mate. In this step you will be able to review, update and correct any information before doing the actual import into W2 Mate. Please note the following. 7 ) Once you are ready click next to do the actual import of 1099-INT forms inside W2 Mate. 8 ) With the 1099-INT data inside W2 Mate, you can navigate to the 1099 & 1098 recipients screen to review the list of 1099-INT recipients. 9 ) When you are ready to print QuickBooks 1099-INT forms, click on 1099&1098 forms. In this screen you can review all 1099-INT boxes and print the forms you need. We highly recommend that you download a free demo of our software and see exactly how the QuickBooks 1099-INT import works inside W2 Mate. If you would like to file QuickBooks 1099-INT electronically you simply use W2 Mate to generate the 1099 electronic submission file and then you upload that file to the IRS FIRE System.